A crisp, clean look for a couple that loves to cook together. 1) The white laminate Fritz Hansen Span table influenced Reid’s choice of white Caesarstone for the island countertop. 2) Sepia-tone photographs above the B&B Italia Luis sofa (“greatest sectional ever,” Reid says) are by RISD graduate Bethany Obrecht, a friend of Reid’s oldest daughter. 5) The stainless steel countertop was a great decision. “Anything from the oven goes right on it,” she says. Hidden outlets accommodate the mixer for baking. 8) Although Reid initially considered matching the Varenna by Poliform counter stools to the elm cabinetry, she ultimately chose to match them to the laminate-wrapped island in charcoal so they would disappear when pushed in. 9) The coffee garage’s aluminum roll-up door hides morning clutter. A drawer below stores tea. 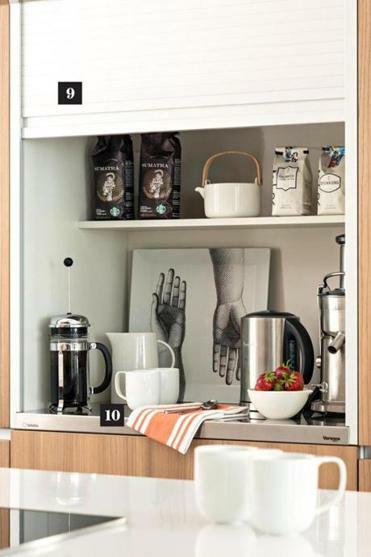 10) The niche is electrified for the teakettle and coffee maker; cleanup is easy thanks to the stainless steel countertop.